President Donald Trump and Vice President Mike Pence visit the Martin Luther King Jr. Memorial on Jan. 21, 2019, in Washington, D.C. They placed a wreath to commemorate the slain civil rights leader. 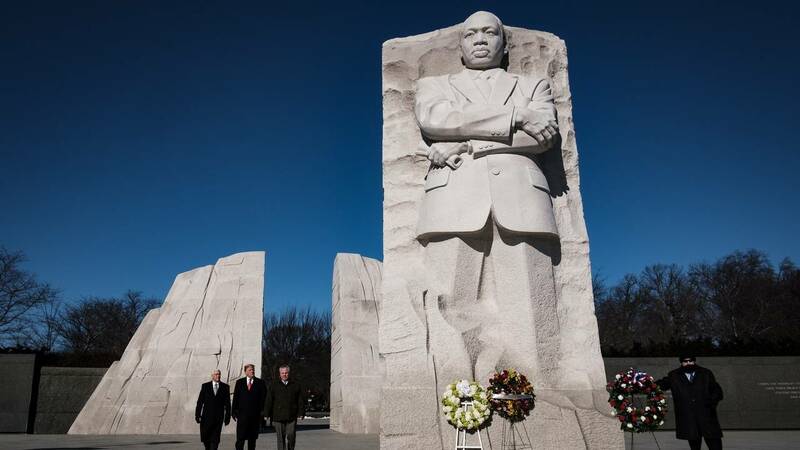 (CNN) - President Donald Trump made a brief, unannounced visit to the Martin Luther King Jr. memorial on the National Mall in recognition of the holiday honoring the civil rights icon. The President began Martin Luther King Jr. Day by touting economic growth on Twitter and releasing a presidential proclamation for the holiday. "Today we celebrate Dr. Martin Luther King, Jr. for standing up for the self-evident truth Americans hold so dear, that no matter what the color of our skin or the place of our birth, we are all created equal by God. #MLKDay," Trump tweeted Monday morning. "We recommit ourselves to the advancement of equality and justice for all Americans, and to the full realization of (Martin Luther King Jr.'s) worthy dream," it read. Soon after tweeting the proclamation, the President took to attacking Democrats. "Democrats campaigned on working within Washington and 'getting things done!' How is that working out?#2020TAKEBACKTHEHOUSE," Trump tweeted. Last year Trump spent the holiday golfing at his Mar-a-Lago property in Florida. A day ahead of the holiday last year, the President declared that he was "not a racist" following reports alleging he had referred to Haiti and some African nations as "s**thole countries" in a closed-door meeting about immigration. In 2017, Trump kicked off MLK weekend by zeroing-in on one of his frequent critics, civil rights activist and Georgia Democratic Rep. John Lewis. The Saturday ahead of the holiday, Trump tweeted that Lewis "should spend more time on fixing and helping his district, which is in horrible shape and falling apart (not to mention crime infested) rather than falsely complaining about the election results. All talk, talk, talk -- no action or results." He also met with Martin Luther King III at Trump Tower in New York. The last three presidents often took part in service projects to mark Martin Luther King Jr. Day. But like last year, Trump is not scheduled to participate in any service projects on the federal holiday he and every other US president have designated as a "day of service" since 1994. US presidents have typically observed the holiday publicly, making remarks or attending events honoring the day.